Even if you consider yourself a good essay writer, your experienced examiner may still find some mistakes that usually go unnoticed. You should endeavor to learn about these mistakes and make sure you check your paper twice before you submit it to your examiner. 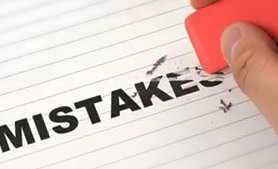 Although you have to deal with certain mistakes, here are a few of the most common ones of them all. The most common mistake is misspelled words. You may call them typos, but they can affect your grade in a big way. Many students think this spelling issue is usually confronted by those who have to submit handwritten essays. This is not true because even those who work on MS Word or another software/application sometimes have to deal with the same issue. To avoid it, nothing works better than proofreading your essay once or even twice after the work is through. In addition to these misspelled words, you may often overlook certain editorial mistakes, like using "it's" instead of "its". The biggest reason why students often don't notice these mistakes is that they are similar sounding words. It is therefore easy to miss them even when you proofread your research paper for the first time. Another common mistake is to use the Passive voice. You need to understand that your essay needs to be very revealing in several ways, and you cannot create a right impact using the passive voice. Punctuation errors are also common. The problem is that students usually don't know if they are going overboard with the idea of using correct punctuation. Sometimes, overuse of punctuation marks offends the examiner thinking the student is trying show how good they really are with the English language. Similarly, it's equally difficult to understand if you're using these punctuation marks sparingly. Avoiding both extremes is important and takes some practice and understanding of different writing styles.